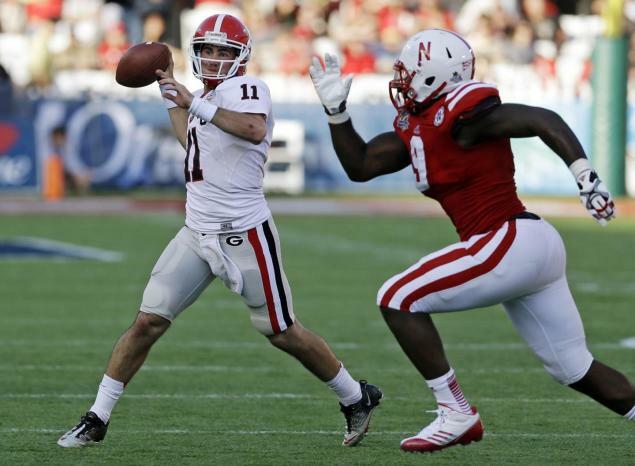 There’s been plenty of talk this season about whether Aaron Murray is a good enough quarterback to get Georgia to where they want to be, which is among the nation’s elite. After an up and down season for the junior, Murray erupted in the Capital One Bowl by throwing five touchdown passes (amid his usual mistakes) to pretty much redeem himself and his prospect credentials. Nebraska had the number one pass defense in the nation going into the game, but they really couldn’t contain Murray, finishing with 427 yards (18-33), five touchdowns and 2 interceptions. Nebraska did hold a 31-23 in the middle of the third quarter, but their secondary missed some big shots at interceptions or simply denying a key pass, and Murray threw three touchdowns to seal the game at 45-31. We’re real proud of Aaron and job he did. He had a couple of things go not exactly the way he wanted them to go. Had a couple of picks early. Just hung in there, very resilient and finished. The moment Nebraksa began chasing the Bulldogs in the fourth, knowing they need to start throwing the ball, it was over. Taylor Martinez is an exciting quarterback to watch and he can make plays with his arms, not just his legs, but he does have a problem avoiding the bad throws and forcing plays. He was intercepted twice, including in the middle of the fourth, which ended any chance of coming back to tie the game. Martinez did throw a couple of touchdowns, but this team is about running. Nebraska ran for 239 yards, Rex Burkhead going for 140 and a touchdown, also catching one for six off a Martinez throw. One of the great things Georgia managed to do was contain Martinez’ running game, as the quarterback, known to break off into wild, yard crunching strides, was held to only 46 yards on 20 carries. Nebraska needed all of their ground phenoms to perform well in this one, and fell short with their quarterback. For Georgia? Todd Gurley was the man on the ground. Gurley, capping off a fantastic freshman season, ran for 125 yards and a touchdown, finishing the year with 1385 yards and 17 touchdowns. Keith Marshall also had a very good day, although the other Georgia running back Freshman was a bit more successful as a receiving option, scoring a touchdown and catching 3 passes for 39 yards, gaining 36 on the ground. Was it another case of SEC speed being too much for the Big Ten teams? In a way, but it was also a matter of talent and depth. Nebraska have an excellent running game of both power and speed. They just didn’t have the quarterback to give them the kind of variety Aaron Murray does. 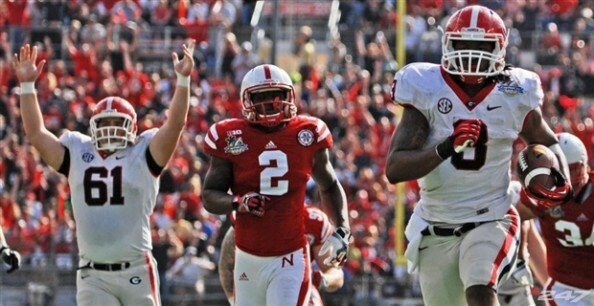 After getting pressured all afternoon, the Nebraska secondary simply collapsed. Jarvis Jones was a big reason Taylor Martinez looked bad. Martinez was sacked five times, twice by Jones, setting a single season record of 14.5 in 2012, and will now have to decide if he’s staying for another year or leaving to the NFL, where he will be warmly welcomed. After a good defensive season for most of the year, Nebraska end by giving up more than 110 points in their two final losses. A 10-win year, but with a bad taste to it in the end.